I took this picture with my new (to me) Nikon D5100. I'm still very new at DSLR photography but I went on a short "nature walk" in Redmond, WA during lunch today. 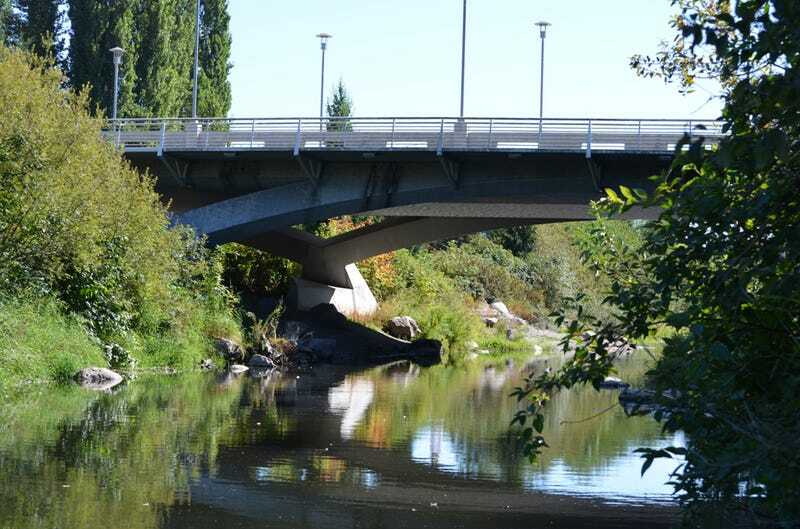 This is a picture of a bridge going over the Sammamish Slough. It took a bit of travelling off the main trail to get down to the water. When I got there I found there was a rock sticking out of the water just off the shore so I stood on it and was able to get a pretty good angle. My first idea was to take a picture of the ducks that inhabit this part of the slough but the pictures I got were too dark. This is my first submission so be gentle! Nikon D5100, 55-300m lens with hood, 55mm focal length, 1/125 sec., f/7.1, ISO-100. I saw this sign on the way home riding my bike today. This ended up at 28 focal length. Running that through http://www.digified.net/focallength/ I was able to figure out the conversion of my camera's 1/1.8" CMOS Sensor. This ended up being 1/133 (1/fl) or 1/266(2/fl). With that I captured this picture at 200 ISO with 1/200 shutter (for exposure reasons). I guess someone is afraid that the seniors will pinch your cheeks too hard or something. The reason I selected this shot was because I liked the order of it all. These very large machines that are used to move around shipping conexes all just parked ever so neatly in a row. I think that the machines being so close together, so in line and also so close to the barriers next to them just seems very orderly. It gives the photo pretty clean lines and I think it pulls you in. I'm currently stationed in Camp Arifjan, Kuwait with the 316th Sustainment Command (Expeditionary). Camp Arifjan is a gold mine of random crap. There are a ton of container and material yards with things piled everywhere. On Friday afternoon we decided to run around the base and snap whatever pictures we could. We were stopped by base security a few times, but it didn't end up being a problem. I got this shot near a row of machines designed to pick up containers and move them from one place to another. They are huge pieces of equipment that take up the entire row. One of the highlights each year of Baltimore's Hampdenfest street festival is their toilet races, a head-to-head go-kart competition where every racer is built around a toilet. I was able to grab a great seat on the curb, about halfway down the track, and to avoid too much motion blur, decided on shooting at 1/2xFL. It took me a while to get used to shooting my burst in a smooth pan as the racers went past (a lot of horrible framing and blurry images), but eventually I was able to dial it in and get three or four great shots of various karts. This picture came together perfectly, with the entire (long) racer in frame and the rider triumphantly pumping her fist in victory...even though the other kart she was facing was so much faster that he was completely out of frame by the time she came by. Nikon D5100, 30mm, 1/60, F/29, ISO 400. Sony DSC HX100V, f/5.6, ISO800, exposure 1/1600. 35mm focal length equivalent is aprox 810mm. Calculated based on a 5.64 crop factor, with a 30x zoom (144mm). My girlfriend is a nurse at a hospital a few kilometers away and she had worked a night shift. I had left to pick her up about 45 minutes early and was just sitting in my car having a smoke when I saw this bird on top of a Coral Tree. I thought the church in the background would make for a nice photograph. The sun was barely high enough to provide any decent light at all, so I had to set the light sensitivity rather high to counter the short exposure time. worked really well - thanks for the tip! This is my second time submitting, and after reading the challenge a few times I decided I wanted to try at least two methods. I shot pictures two different days. The first day I shot in (what I think) was a 1:1ratio. Day 2 was a 1:2 ratio. I walked from my apt to the GG Bridge and was on a bench watching the sunset and I realized this was kind of a cool framed picture off the bridge. Nikon D3100 with a 18-55mm lens. This time of year here in Seattle the Cross spiders go nuts with web-building. Despite my fear, I like to brave deathly spidery peril and get some cool macro shots. They weren't out in time for the bug challenge a few weeks ago, but this one was dozing in the afternoon sunlight, just begging to be photographed. My camera doesn't have any IS/VR, and I was reaching around behind the web with one hand, so I needed every bit of the 1/2xFL speed. After taking crop factor into account, I was at 1/1.4xFL, so I actually split the difference between 1/FL and 1/2xFL. had to bump up the shutter speed to 100. I had never heard of the 1/2x focal length rule until this challenge and it came at the perfect time. I made my first trip to the US Open this weekend, and my tickets were in the nosebleeds so bringing a telephoto lens was a must. Given the distance from my seats to the players I was pretty much always shooting at 300mm, so I used the closest shutter speed to 1/600 my camera could do which ended up being 1/640. I chose a shot of Novak Djokovic serving since it showed the athleticism and concentration needed to hit 130ish mile per hour serves to within a few feet on the court! I got to see some great tennis and learned a new photography trick which made for a pretty good weekend! Was shooting pictures of some ducks near where this dog was playing in the water. Its owners were trying to keep him away from the ducks, but finally he broke free and charged down the river bank, gleefully sending the ducks flying. I think the dog's expression says it all. We had been out shooting most of the afternoon, and came home for a quick pick stop. I was standing in the front yard which is overgrown with dandelions and got the idea of an extreme low angle, capturing one in silhouette. When my girlfriend came back out I was holding a dandelion up to sun with one hand and the camera in the other. She volunteered to hold it up while I snapped the photo. I'm not sure whether the fish is astonished or hungry. Astonished because I was trying to click it with a 70-200 mm (who does that? Its crazy!!) or hungry for "stars", just ready to gobble the whole world into darkness :-) Although this was a well lit aquarium with a yellow wall behind, trying to maintain minimum shooting distance + a shutterspeed of 1/2xFL resulted in these black background pics giving the impression that the fish is flying in a star spattered cosmos of its own !! Apparatus : Canon 7D, EF 70-200 mm IS II at 200 mm and 1/400 s. Post processing- saturation & vibrance increase.